SOABYTE | SME in:Oracle SOA,Oracle Weblogic,Oracle AIA, Oracle SOA Suite Training, Oracle RODOD Implementation & Oracle SOA Training. It dont work for many (including me). COM port not available in TKFileExplorer Settings. Annoying Advertisment every 10 Seconds. Cannot work continuosly, it forces you to visit a link. Open http://m.getjar.com from your mobile browser. Search for Minicommander in the search box. Click Minicommander in the search result. Now click Download Minicommander, It will be automatically installed in your Phone. Download the necessary game or application to your PC. Let us consider you have downloaded Mario.jar. Copy the Mario.jar file to the G:\JavaGames\Mario. Run JadMaker from the Start Menu. Drag the Mario.jar to the JadMaker window. New .jad file called Mario.jad will be created in the folder. So your folder G:\JavaGames\Mario will have Mario.jar and Mario.jad. Now connect your phone to PC using your USB cable. Copy the folder G:\JavaGames\Mario to your menory card. 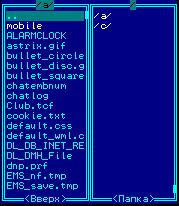 For example consider you have copied the 'Mario' folder to a folder called 'Applications' in memory card. Now disconnect your phone from PC. Minicommander's UI will be like this. Open /filesystem/ in the left hand side. select Mario folder in right hand side. Press '5' in the number pad at the bottom of the screen. Now open up your key pad and enter *#6984125*#. This brings up Admin Settings. Choose INTERNALS and enter the master key *#9072641*# and confirm. This brings up Internals screen. Now scroll down and choose Storage Settings. Finally Create AX Dat File. Exit the settings by pressing the Call Cancel key. Go to Menu -> Applications -> Games & More. You can see your newly installed Mario Game. SOABYTE by Team Fusion is licensed under a Creative Commons Attribution-ShareAlike 4.0 International License.